Wooden Bee & Ball Cup Game is a classic wooden toy which has been around for generations. The idea is to try and get the attached ball to land in the cup by swinging the ball around and up. You are not allowed to touch the ball. 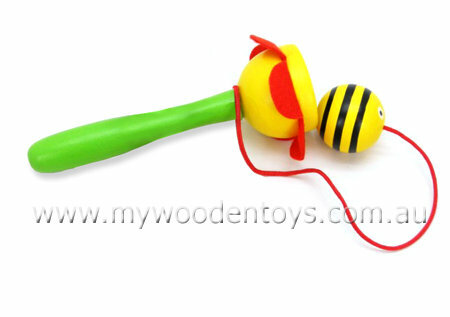 This toy takes the classic game and gives it a bee and flower twist. The cup has felt petals. We like this because: "Great version of this classic game."